The 116th Congress is now in session. 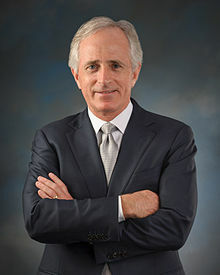 That means Tennessee Senator Bob Corker is now FORMER Tennessee Senator Bob Corker. In his 12 years in the US Senate, Corker rose to prominence thanks to his general affability, and his willingness to get in front of a camera just about anytime someone asked. It also helped that he didn’t seem like a nut when he was talking. Thursday, Tennessee’s Gannett owned papers ran an article about Corker. The headline for that article trumpeted his bipartisanship. Corker did have a history of occasionally reaching across party lines. But just how bipartisan was Bob Corker? How do you define bipartisanship? Defining just what “bipartisan” means can be tricky. For some on the extremes of the political scale, bipartisan is a kind of slur hurled at people who aren’t ideologically pure enough. But there are other definitions of bipartisan that come into play. When Columnists talk about bipartisanship, they might be talking about a specific bill. When they’re talking about a specific person, it can take on another meaning…a measure of “reasonableness”. By reasonableness, I mean something along the lines of: “I wouldn’t be embarrassed to invite this person to a dinner party”, or “This person doesn’t seem like they have a basement full of well preserved body parts lying around”. In short, they’re saying this person isn’t a nut, but all those other people who aren’t like them, are. This becomes problematic because labels carry over from the editorial side to the news side pretty seamlessly without trying. So even though a person may vote with their party 90% of the time, they get the “bipartisan” tag because conventional wisdom has so knighted them. Rather than examine the “feel” of Senator Corker’s bipartisanship, I decided to take a look at some metrics. There are a lot of ways to measure bipartisanship. All have plusses and minuses. So I’m going to look at a couple of different measures. First, how often did Sen. Corker vote with his party? According to Ballotopedia, Corker voted with his party over 87% of the time in 2013 and 2014. That hardly seems all that bipartisan, but voting with party is to be expected. What he broke with his party on is really important. Also, his party ran the Senate in those years, so their bills were the ones that came up. Not surprising he voted with them. Govtrack.com has a neat index of leadership and ideology that you can see here on the left. Corker shows up about mid-way on the leadership score, and close to the mid-way “no man’s land” in the ideology score.But even that doesn’t mean he’s some kind of bipartisan icon. Propublica has a cool tool where you can compare Senators. Corker voted with Senate Majority Leader Mitch McConnell 94% of the time. He voted with Senator Susan Collins (R-ME), a known and proven bipartisan voter 87% of the time. For comparison’s sake, he only voted with Joe Manchin (D-WV) 56% of the time. Manchin is the most conservative Democrat in the Caucus. You could look at partisan leaning organizations like Freedomworks and NumbersUSA on the right. They rank him at 70% and 60% respectively. That seems more “bipartisan”, but when you dig deeper to see who scored higher, you start seeing the scary people in the Senate. None of these metrics seem to use the same methodology. Nor do they all look at the whole body of Sen. Corker’s work. Thankfully, one did fully express their methodology, and seems to be a pretty fair estimation of a member’s bipartisanship. The Lugar Center, named after former Senator Richard Lugar, has been working on quantifying bipartisanship. In cooperation with the Georgetown McCourt School of Public Policy, the Center has developed a Bipartisan Index. The index takes a look at all the Senators for a given session, and rates how well and often they reach across the aisle to find consensus. If you’re really interested in this, take a look at their methodology. So rather than guess, or go by “feel” like so many people do, there are real numbers. Here are a couple examples: Over his tenure, Senator Corker was the 39th most bipartisan member of the Senate. Through his tenure he only dropped below 30 in one session. By contrast, Senator Susan Collins averages out to be the 3rd most bipartisan. Joe Manchin is the 7th. So while Corker is definitely more bipartisan than most…he’s not by much. I took the numbers from each session of Congress Sen. Corker was a member of and put them in an interactive chart. You can look up these numbers here. As you can see, Senator Corker is much more bipartisan than the least bipartisan member. He’s also much less bipartisan than the most bipartisan Democrat or Republican. He’s a middle of the road guy. So is Senator Alexander, whose numbers are included in the Chart. But Corker is no model of bipartisanship. Here’s a chart with his average against the Senate average. Looking at this, its pretty clear that Corker’s bipartisanship was well below the Senate average for the vast majority of his tenure. There’s no question that Senator Corker has left a legacy…and one that he’s proud of. I’m not trying to take any of that away from him. But the hard truth is over his time in the US Senate, the body became more partisan. In that environment of hyper-partisanship, just about anyone who’s willing to listen just a little to the other side comes across as a bipartisan hero. Senator Corker didn’t really discover that bipartisanship until the end of his tenure. I think that’s worth noting. Lets not pretend it was the norm for his 12 years in the Senate. Senator Corker benefited from what I call the “media darling” effect. DC talkers and TV personalities liked Corker because he was relatively well spoken, knowledgeable about most topics, and would say the word bipartisan when he needed to…something more valued in the DC press than anything. With bipartisanship it looks like institutions that are, in a lot of ways broken, are working. No one walks away from a bipartisan deal happy, which gives them something more to talk about. So its not surprising that the Tennessee papers of the USAToday network wanted to push Corker’s bipartisan credentials. An article with that headline checks both boxes for them. But bipartisanship isn’t a panacea. There have been plenty of bipartisan bills that have been disasters. The media pushes bipartisanship on legislation for the same reason they push horse race coverage for elections….its easier. Its shorthand for consensus. They don’t have to get their hands dirty in the good, the bad, and the ugly. Corker’s legacy was safe regardless of the label. Especially considering who replaced him. But calling him “bipartisan” is a stretch, unless you’re only comparing him to the most partisan members.